As Per the Official Website of Railway Recruitment Board MUMBAI at (http://www.rrbmumbai.gov.in/), the Online Application for the 4625 no of Vacant Post are open under Post Vacancy for CEN 2 -2018 Level 1 of 7th CPC Pay Matrix. 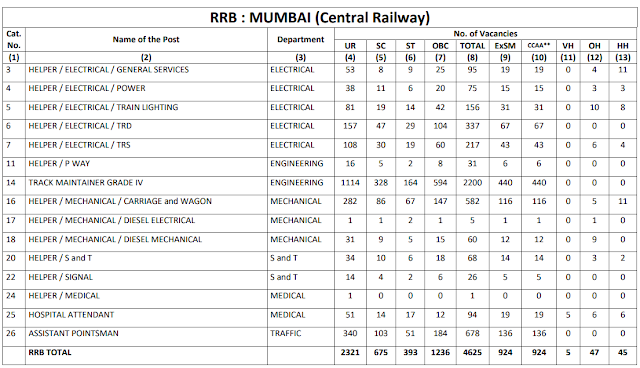 The RRB Recruitment MUMBAI published a Total of 4625 no of Vacant Post. The Railway Recruitment Board MUMBAI Vacant Posts available are for Helper, Electrical, Power, Train Lighting, TRD, TRS, P Way, Track Maintainer Grade IV, General Services, Mechanical, Carriage and Wagon, Diesel Mechanical, Diesel Electrical, S and T, Signal, Hospital Attendant, Assistant Pointsman under Indian Railway Departments namely Electrical, Engineering, Mechanical, S and T, Medical and Traffic.